Last week, I received a Wish-RAK from a member of the Wish-RAK society over on Splitcoaststampers.com. I was thrilled to get my hands on one of my favorite images by Whipper Snapper. He's the cutest little duck you've ever laid eyes on. So, immediately, I went into my scrapbook room and created this card I call "DuckLove." The elements I used: K&Company patterned paper, ribbon from Michaels and JoAnn, Copics markers, Martha Stewart's scalloped punch. The sentiment is from Paper Pretties. 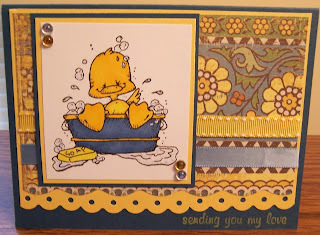 To highlight the bubbles and water splashes, I used the diamond Stickles.